The text above contains the most central themes of the morning prayer service and most clearly defines our relationship towards the Almighty. We arise each morning and praise Him for all His wondrous creations in this universe and thank Him for all the blessings that He bestowed on each of our lives through a series of songs scattered throughout the Mizmorim (Psalms) of the Tehillim. For at least 600 years, since before the days of the Mahzor Aram Soba (1527, 1560), and before that in Spain, praising God through poetry, namely "piyyut," and song, namely "pizmonim," has become a major foundation for Middle Eastern Jews in how they approach worship. When I first met my great grandfather, Gabriel A Shrem, he exclaimed "You made me GREAT!" As his first great grandchild, born at the tail-end of his lifetime, I, indeed, elevated his status into a "great" grandfather. Daddy Gabe, as we referred to him, was a constant presence in my life, even after he passed away. I was brought up in his shadow by the members of his family, in his house, on his street, in his synagogue (Bnai Yosef Congregation ; The Avenue P Shul), by his student (H Mordekhai Nadaf at Sephardic Minyan of Yeshivah of Flatbush), using his prayer books (Beit Yosef VeOhel Abraham), his pizmonim book (Shir Ushbaha Hallel VeZimrah), and listening to his Hazzanut tape recordings on a nightly basis during my formative years. From an early age, I became his biggest fan and understood that my sole responsibility in life was to make him "great." The Sephardic Pizmonim Project was founded in 2002 with the digitalization of the Gabriel A Shrem YU tape cassettes by my great uncle Al Heffez and I. These tape cassettes, which were introduced to me by my Grandmother, Florence Shrem Zeitouni, served as the official curriculum of the Sephardic Hazzanut class at Yeshiva University Cantorial Institute in the 1970s. They included more than 300 pizmonim, classified by Maqam, from the Syrian Sephardic Jewish hymn book, "Shir U'Shbaha Hallel VeZimrah" (1964); the book created by Cantor Shrem, published by what is now known as the Sephardic Heritage Foundation, under the leadership of Sam Catton. After two long years of tedious hard work with numerous volunteers, the "Gabriel A Shrem Pizmonim CD" project was officially a reality; cementing more than 300 pizmonim into the collective memories of our people. After finishing the CD project in 2004, it pained me to see that there were over 300 remaining pizmonim texts in our collection that had no melody recordings to them, which meant that without intervention of obtaining recordings, their melodies would be forgotten and be headed towards extinction in the near future. From that point forward, I committed to spending my remaining time to continue Cantor Shrem's mission, and forward the effort to preserve the remaining 300 pizmonim of our Red Book as well as Sephardic pizmonim from other sources. I took this mission very seriously and put this initiative on the top of my priority list. Using the Index of the Red Pizmonim Book, I organized a full "Preservation Checklist" of all the songs that we were missing recordings for and went from Hazzan to Hazzan throughout the community with this checklist and a digital recorder. In late 2004, this website, pizmonim.org (as well as pizmonim.com; courtesy of Erol Dusi), was created by Rabbi Dr Ricky Hidary of Merkaz, and designed by Sam Franco and Charlie A Shrem, in order to facilitate our efforts in sharing our archives with the public for free. One of the first volunteers to record the "missing" pizmonim was Isaac J Cabasso, one of Gabriel A Shrem's colleagues, and cantor of Congregation Beth Torah in Brooklyn, NY. Over the course of ten years (2004-2014), Cantor Cabasso, recorded more than 200 pizmonim for the website. Over the course of these years, many other individuals from around the world have contacted the project and have made significant recording and other contributions. In addition, many individuals, namely Joseph Mosseri, Morris Arking, Mickey Kairey, Rosy Hamaoui, Moe Tawil, Menahem Mustacci, Ezra Zayat, Uri Amram, and Ezra Ashkenazi, provided me with access to their private pre-existing tape collections. At this point, we are currently down to the last 65 missing songs in our "Shir Ushbaha Hallel VeZimrah" pizmonim book. 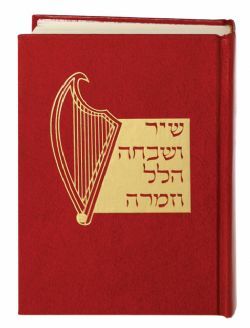 In addition to the Red Pizmonim Book, over the course of these ten years, many other recordings and documents of liturgical importance, such as the Torah (by Abe Zami and Mickey Kairey A"H), Haftarah (Mickey Kairey), Tehillim (H Barukh Ben Haim A"H and Max E Tawil A"H), Megillot (Joseph "Susu" Hamaoui A"H, H Barukh Ben Haim A"H, and Max E Tawil), various Maqam calendars, and Hazzanut notes (H Moshe Ashear and Gabriel A Shrem A"H), in general, have been added to the website in order to become a complete comprehensive guide for the studies of all students and visitors. Many copies of manuscripts from nineteenth century Aleppo have been acquired from Israeli institutions with the help of Alberto Attia in order to provide commentary and historical background of each pizmon. As a person who has lived away from the Syrian community for a few years in pursuit of a professional career, this great website provided me with an excellent avenue to maintain my strong connection to the Syrian Jewish heritage; accomplishing my life goal of making Gabriel A Shrem "great." It is my deepest hope that this great website is used as a tool throughout the world to learn or reconnect with this great unique musical and liturgical heritage of Syrian Jewry. We hope that this endeavor promotes a deeper appreciation of pizmonim and enhances your experiences during the Shabbat prayers.